There is one major problem with Gates’ professed reliance on “data,” which is that the #philanthropist ignores fundamental historical facts governing infectious disease and vaccine timelines. The same researchers, in another article, chastised the medical establishment for its misplaced confidence in “magic bullets” (there is that word “#magic” again!). 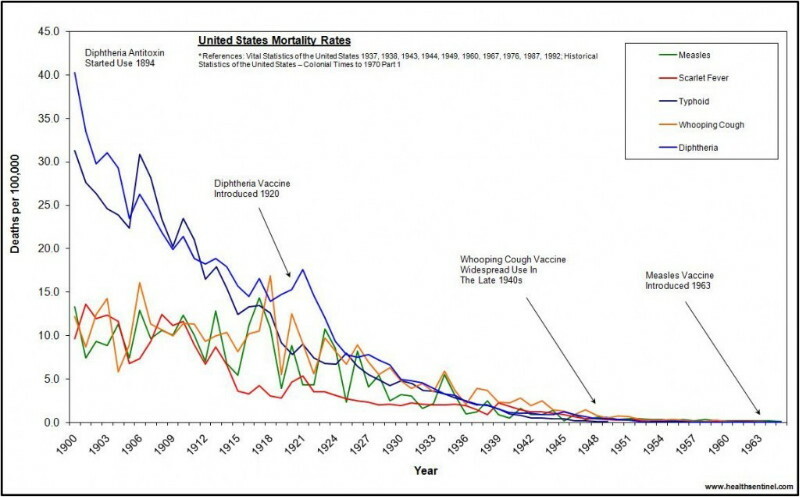 Instead, if the decline in infectious disease incidence and mortality in the last century represented any kind of “#miracle,” the phenomenon was, by all honest accounts, attributable to classic and long-term public health measures such as better sanitation and, especially, improved nutrition. A study of 20th-century mortality trends in Italy found a significant association between increased caloric intake and declining mortality, reflecting “progress in average nutritional status, lifestyle quality, socioeconomic level and hygienic conditions.” Moreover, mortality dropped most sharply in Italy’s youngest age groups—who were “probably the most sensible to the changes in nutrition and wellness.” Even early 20th-century epidemiologists who were inclined to give some credit to vaccines recognized that other factors were at play, including changes in “human resistance and bacterial quality” as well as factors yet to be determined. One in six American children has a developmental disordersuch as autism spectrum disorder (ASD). Pediatric autoimmune neuropsychiatric disorders associated with streptococcal or other infections (PANDASor PANS) may affect as many as 1 in 200 children in the U.S., including up to 25% of children diagnosed with obsessive-compulsive disorder (OCD) and tic disorders. In the U.S., the infant mortality rate, including from sudden infant death syndrome (#SIDS), is double the rate in many other high-income countries. In Africa, a comparative study in Guinea-Bissau found that infant mortality was at least twice as high (10%-11%) in children who received the diphtheria-tetanus-pertussis (DTP) and polio vaccines as in children who did not receive the vaccines (4%-5%).